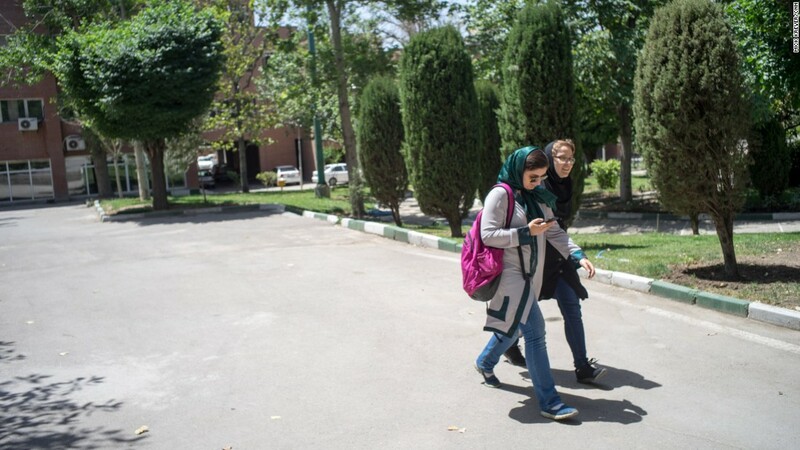 Tehran, Iran (CNN) Sporting earbuds and sagging backpacks, students lounge on patches of grass, shaded by trees from the harsh sun. They sit in the library, hunched over laptops, massaging their temples, cramming for tests or bashing out lines of code. 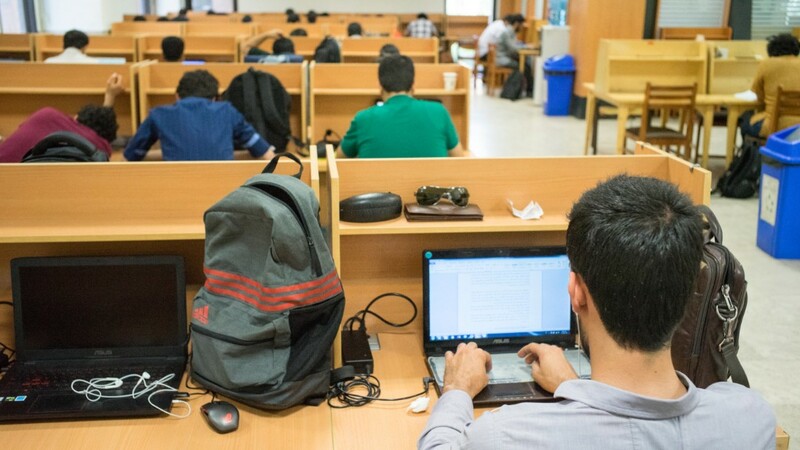 It could be a college campus anywhere in the world, but Sharif University of Technology sits in the shadow of the Azadi tower in Iran’s capital, Tehran. SUT represents the aspirations of a generation of Iranian policy makers who, in the wake of the 1979 revolution, were determined to put their country on the science and technology map. 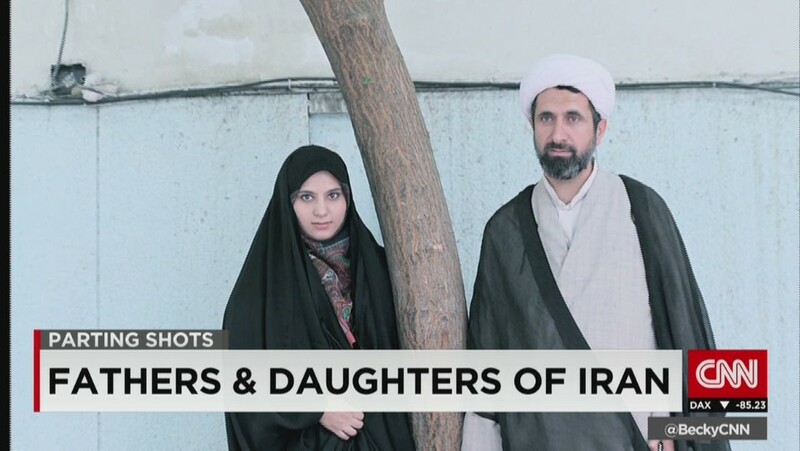 It is often called the MIT of Iran — re-imagined after austere beginnings, based on the example of that American powerhouse, Sharif President Mahmud Fotuhi Firuzabad told CNN on a recent spring morning in Tehran. Be that as it may, Iran’s educational leaders must also brace themselves for the fact that Sharif is a conduit out of the country. The university cites as a point of pride the mathematician Maryam Mirzakhani, an alum who in 2014 became the first woman to win a Fields Medal, the Nobel Prize of mathematics. Now, though, she’s a professor at Stanford University, not Sharif. Iran’s 1979 revolution swept aside a Western-backed monarch, and with it a system of outward dependency. “Going back really to (the) early stages of the revolution, but it continues, the government has really invested in education, partly to address inequality,” says Arang Keshavarzian, associate professor of Middle Eastern and Islamic Studies at NYU. That investment took on new importance after the bloody Iran-Iraq war launched by Saddam Hussein, says Salehi. What’s life like inside Iran? The resemblance between Sharif and major Western universities doesn’t extend much beyond the groups of students chatting beneath the trees outside — the buildings are heavy on breeze block and concrete. There are no starchitect-built theaters here, but faculty members and students speak of the place with pride. SUT staff would not allow CNN to chat to students on campus, but we spoke to several on the streets nearby; they are identified here only by their first names, as some of their comments could be considered controversial. The university is “the best in the country,” says 25-year-old electrical engineering student Mehdi. 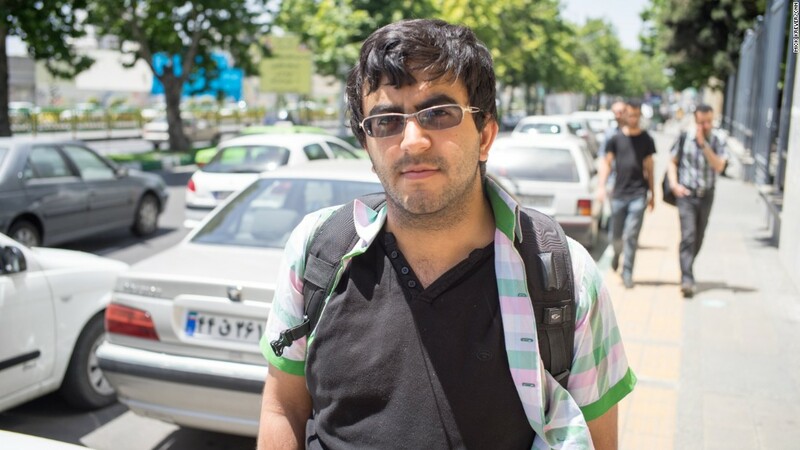 Walking to campus with four friends, Kiarash says that the “university atmosphere is way better” than most other Iranian institutions. Kiarash’s generation lives in a different world to that of their parents; through the internet, Western culture reaches Iran like never before. Though many social media websites, such as Facebook and Reddit, are officially blocked, simple workarounds mean they are easily accessible. Encrypted messaging apps like Telegram have taken off, and allow of a form of communication completely out of the government’s sight; even Iran’s presidential campaigns have embraced Telegram. Students like Kiarash and his friend Pegah, 20, recognize their privilege, but expect more. 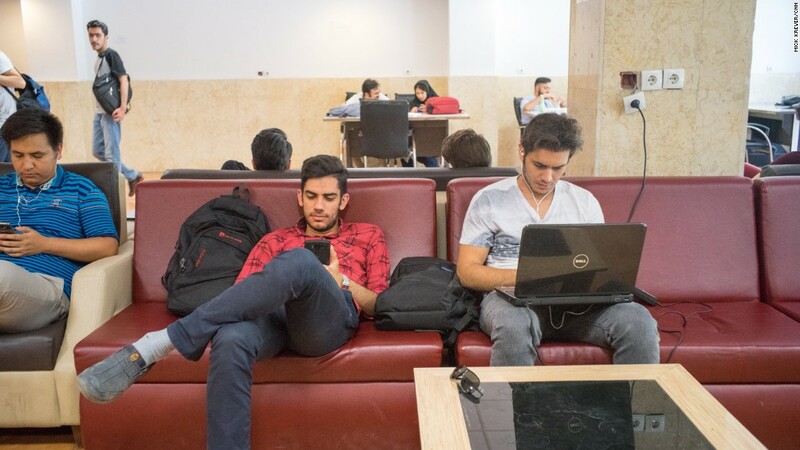 “It’s known to be the best university of Iran, but we don’t have much facilities,” says Pegah. And there are bigger, more fundamental issues. Their clothing would fit it in at any Western university — jeans and T-shirts. 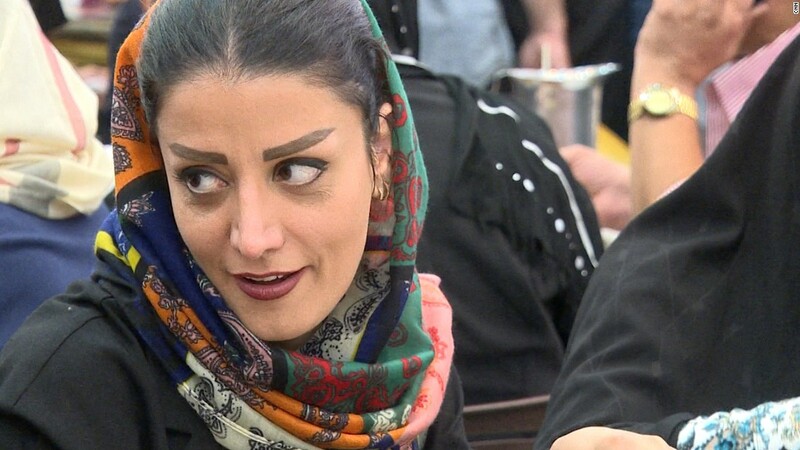 But Pegah, who is female, must adhere to Iran’s rules mandating conservative clothing for women. One way around this, Habibi says, would be to “create small areas where (a) more diverse lifestyle is tolerated” — think Dubai, an outpost of liberal excesses in a fundamentally very conservative country, the United Arab Emirates. That model has been successful in attracting foreign investment, and convincing multinationals to set up shop. In Iran, there is a constant tug-of-war between politicians like President Hassan Rouhani — reform-minded, at least by Iranian standards — and the conservative, revolutionist clergy, with Supreme Leader Ali Khamenei at the helm. It’s evident everywhere in Tehran, where you’re as likely to pass a woman covered head to toe in a flowing black chador, as a woman made up to the nines, with coiffed hair, designer clothes, and a scarf half-way back on her head, barely conforming to rules requiring female head coverings. The Iranian government, says Habibi, has thus far resisted implementing any Dubai-style system in Iran. 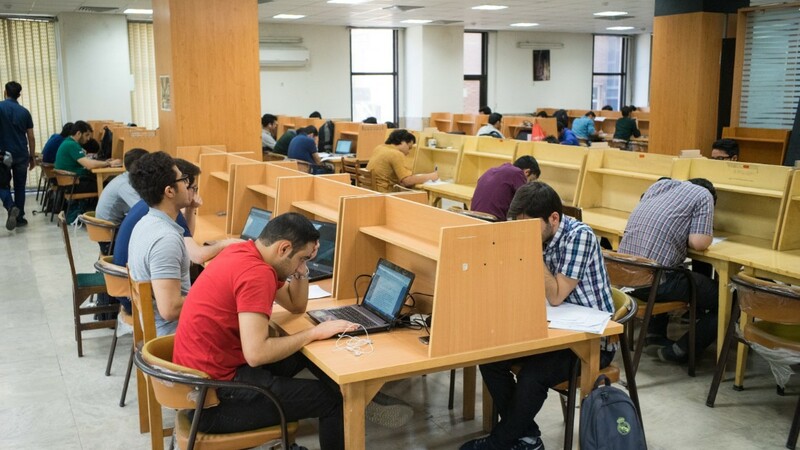 Keramati says the transition was difficult, but he had company — in the form of roughly 8,700 Iranian students studying in the US, according to a 2014 study by the Washington Institute for Near East Policy. They’re among as many as 50,000 Iranians studying around the world. Stanford even has a Persian Students Association, which Keramati says picked him up from the airport and helped him get acclimatized to life on a US campus. There is a rich history of Iranians seeking greener pastures — at least temporarily — abroad. President Rouhani studied in Scotland. His foreign minister, Javad Zarif, studied in California. SUT’s Salehi got his bachelor’s degree at the University of California at Irvine and his PhD at the University of Southern California before working at Bell Labs in New Jersey, which he calls “one of the best periods of my life.” Firuzabad, the president of SUT, got his master’s degree and PhD in Saskatchewan, Canada. Rouhani, Zarif, Salehi and Firoozabad all came back to Iran, but what of those who don’t return? Some leave because of what they see as a lack of basic civil rights. Others see little hope in an economy in which the real — as opposed to official — unemployment rate could be well over 20%. The “brain drain is significant,” says Brandeis’ Habibi; he says Iran’s government has tried to stem it, using economic incentives. Anyone who receives a government scholarship to study abroad can have that loan written off if they return to Iran to work for a certain number of years, but “that’s only a small fraction of Iran’s brain drain,” Habibi says. Much more significant are the students or professionals who move abroad for better opportunities. Once someone has completed their mandatory military service, Habibi says, the government can do nothing to stop them from leaving. “It is the duty of the government, or the society, to give so many opportunities in our country that a young person who was thinking of leaving would have a bit of a doubt,” he says. The government often reaches out “to educated professional Iranians in … Western countries, to encourage them to come back,” Habibi says; he estimates that the Rouhani government, aided by the lifting of some sanctions, has convinced 100 to 200 Iranians a year to return to work in their homeland. And the desire to leave is by no means universal. But a very unscientific survey found that the call of foreign countries resonates with plenty of Sharif’s students. That’s certainly the case with physics student Satya. As far as she’s concerned, “every one” of the university’s students goes abroad.